Two things happened last weekend that made me question Time. Firstly, I heard Jeanette Winterson discuss time at the Sydney Opera House. She grew up in a household that lived in End Time. When Mrs Winterson had drills to practice for the end of the world she would roll a sheet of paper into a cone and blow hard. On hearing the trumpet Jeanette had to scramble under the dining table for protection. Well, that’s logical. Right? Coming from a strange beginning that was overshadowed by such an oppressive end has set Jeanette Winterson on a search for time that has no boundaries. She found it in books, in creativity and in the mind. “Reading is the work of the soul,” she says. That’s a huge claim to make. Reading is intimate and personal, according to Winterson. It’s how we bring the outside into our inner space, this inner place of comfort, solitude and safety. “Books put into words the things that are difficult to feel,” she says. Other people’s works prepare her for going out into the world. They show her different ways of being. The possibilities they allow are endless. In books and in the mind she found a place where time has no boundaries. Secondly, a friend took me to a play at the beautifully restored Eternity Playhouse in Darlinghurst. 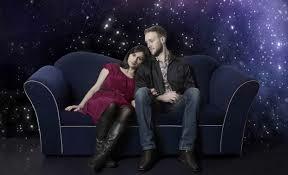 We saw Nick Payne’s ‘Constellations’, a play about a relationship between a physicist and a beekeeper that explored the theory of multiverse. Scenes were repeated three or four times with slight variations in voice tone, or words, or even outcomes. The audience was jolted from one scene to another seemingly unrelated scene and then back again. It took me 15 minutes to realise there was a “sliding doors” thing happening. We were thrown at random between the present, future and past but by the end of the play we understood. I also understood that time didn’t need to have a linear structure. My watch ticks away the hours and minutes in ordered linear fashion. The time it measures isn’t flexible or malleable although I wish it was. It’s heartlessly indifferent to me when I’m running late or when I don’t want summer to end. We’re always being entreated to use our time wisely, as if time were a commodity that has to be tabled or scheduled, and the value measured by how diligently and meaningfully we use it. Even reading has fallen victim to the time Nazis. There’s pressure to read in specified times: last thing at night, on the train, during holidays. I give myself a stern talking to – a writer must read; it’s their job – but whenever I read in the middle of the day I feel I’m indulging in some guilty pleasure. Afternoon delight takes on a whole different meaning. Time wasn’t linear when I was a child. It expanded and contracted endlessly and seemingly at will. The whole of Saturday when I ran through the bush with the neighbourhood kids was much much shorter than Monday’s hourly maths lesson. My memories exist in amalgamated time, and resist being turned into plots on a time line. My eccentric and dearly loved Great Aunt Lil visited us often from Far North Queensland, 2300 km away. There was the time she passed a note with my mother’s name and phone number to the stationmaster through the train window four stops up the line. She told him to ring us because she was coming for a visit and needed to be picked up from our station. In my mind that memory sits next to the visit when she discovered she had cancer, and again when she surprised me by coming all the way down for my wedding even though she was frail and ill. Memories place times together when in real time they’re not close at all. They’re grouped by emotional impact and a huge variety of other connections. Literature understands this truth about time. It moves through time seamlessly, backwards and forwards, speeding up and slowing down. The adult Marcel Proust is dunking madeleines in lime blossom tea and is instantly transported (okay, not instantly, it is Proust) to his grandmother’s house where the whole village he knew in his childhood blossoms to life in front of him. In Virginia Woolf’s ‘To the Lighthouse’ one day passes in 141 pages, and ten years pass in 20. 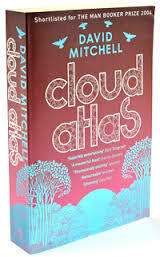 David Mitchell’s ‘Cloud Atlas’ spreads from 1850 to what could be thousands of years into the future, and then turns around and goes back again. Large patches of time are ignored or forgotten. It certainly doesn’t move relentlessly and doggedly forward minute by minute, day by day like my watch. It’s no secret that reading upsets the perceived wisdom of ordered linear time. We read books in a number of sittings. Every time we pick up the book we time travel backwards or forward into it. In between sittings we think about the book. Not just the plot or the characters, themes and ideas. Our mind sparks around these things, and ignites our own similar experiences, or tests us against what we would do in the character’s situation, or any number of feats that meld, blur or rearrange time and send us ricocheting through the ages without any regard for its perceived uniformity. Two things happened last weekend that changed my view of Time. This entry was posted in Books, Reading, Writing and tagged Cloud Atlas, Constellations, Eternity Playhouse, Jeanette Winterson, reading, time, Virginia Woolf. Bookmark the permalink. 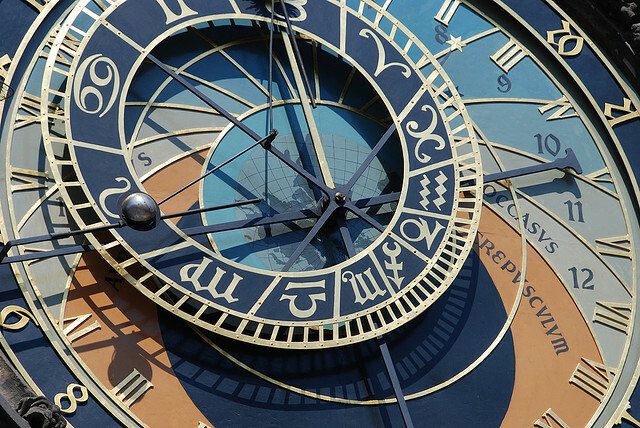 8 Responses to What is Time? Karen, I love the way you’ve reflected on time and the two happenings that took you down that path. I always enjoy the insightful way you make connections and links with other works. Thanks so much for this beautiful and thought-provoking piece. Thank you for those kind words, Anne. Time Travel: Cognition and Memory – similar, comparative, compatible, derivative or fractiously opposing? Time and Memory would seem to be dependently compatible, while Cognition may (not) be time independent – but Re-cognition is time and memory dependent. Your article has sparked my interest in discovering our developmental cognition (new stuff – previously unknown) based on time-dependent memories. And, as you say, our memories can coalesce time so that it is of either no consequence or great consequence. Time (objectively measured) is indeed linear – yet subjectively it is not just a pathway but an entire playground (universe) in which to move. I love, treasure and enjoy the memories I have and grieve over the “loss” of those forgotten, intentionally hidden or traumatically ripped from my being. Literature transports us in time, space, dimension and reality. Happily, for me, this provides the ability to return (progress) to childhood friends, adult friends, new languages and new cultures – as you say – seamlessly at a pace that is modified by the content. Cognition and memory being fractiously opposing – yes! You’ve singled out an idea for a whole series of stories there, Tony. Thank you. I’ll enjoy teasing out the different aspects of the human condition that idea might involve. Our brains are engineered to discard things that aren’t needed, but to have valued memories traumatically taken must be terrible. It’s wonderful we are able to make new memories to treasure and enjoy. I love the way you ended your comment. It gave me tingles. Thanks for adding to the conversation in such an insightful way, Tony. So much food for thought in this post Karen. Thank you. It reminds me that it is not so much what is said or done but the meaning we give it that influences our actions and often our relationships with others. Sometimes that impact can carry through a lifetime. I am often suddenly aware and quite happy when watching a movie or show on TV, when the scenes skip the mundane boring bits and take you to the part you want to find out about. I loved your opening and ending sentences and I too loved Tony’s last comment. HI Margaret. Exactly! The meaning we give what is said or done can have a huge impact on the path our lives takes. It would be fascinating to see just one of the alternative paths our life didn’t take because we made some different reading about those things. Thanks so much for visiting and commenting, Marg. How fortunate you are, Karen, to be able to draw such insight from your experiences; to make them so meaningful. Any consideration of time as a concept requires a certain degree of mental gymnastics for me. And if I expand the concept to include the nature of time outside the material/physical realm we occupy, it gets even trickier. I see time as a physical construct that assists us to bring some sense of order into our lives, but in the spiritual realms it doesn’t exist. My finite mind can’t get around that concept at all. So I absolutely love the connection you’ve made in this post, between literature, time and memories. And I totally agree with Jeanette Winterson that the creative arts, including the reading and writing of literature, are the work of the soul, a spiritual enterprise. Thank you for sharing your ‘cogitations’. Grasping the notion of time requires mental gymnastics for me too, Diana. It’s easier if I can relate it to something practical – like literary structures – but I have to keep reminding myself that they are all constructs to try to make a infinite concept more accessible to us. Can anyone truly understand it? Stephen Hawking might get closer than most. 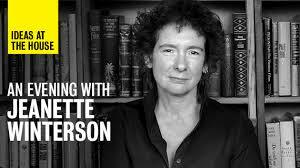 Jeanette Winterson’s talk is now available online. Check my facebook page for the link. Glad you came to visit. Thank you.